Vanessa Williams gets married, or at least her character does, on the series finale of Desperate Housewives this Sunday. Williams is wearing the “Rosebud” wedding gown, an ivory tulle bustier gown with rosebud embroidery from the Spring 2012 Kevan Hall White Label collection. Available by special order, Kevan Hall atelier in Los Angeles, $6400. Dexter actress Julie Benz did get married in real life to Rich Orosco on Saturday May 5, 2012 in a Cinco de Mayo themed wedding. Benz wore a strapless raw edge organza Theia gown and then changed into a Theia strapless organza cocktail dress with a floral applique hem for the reception. Theia wedding gown (style 881185) $1495; Theia reception dress, Bloomingdales.com, $795. Benz’s eight bridesmaids also wore Theia. 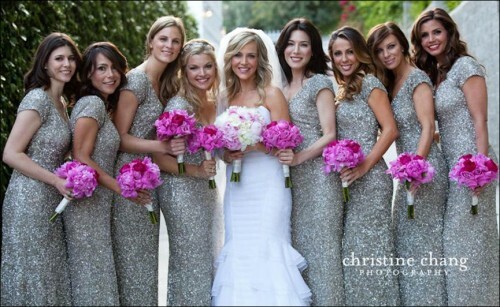 They shimmered in custom rhodium crunchy sequin cap sleeve gowns.